A wonderful photographic board book packed with busy scenes made up of colourful objects to seek and find. 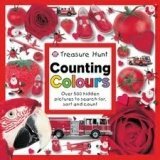 Children will have hours of fun searching the pages, while learning about colours and counting at the same time. With a sturdy casebound cover.